One of the terms which commonly comes up in the world of search engine optimisation, is the phrase “Google Penalty”. There’s a lot of rumours, panic and misinformation about what this actually means, and this article aims to make it all much clearer. A Google penalty can apply to a website which breaches Google’s terms of service. It can affect a single page of your website, or the whole site, and the impact can vary greatly. Some penalties affect a single page’s rankings, and leave it hanging around on page two no-matter what additional work is done on the page. These can occur at any time, and we’ll go into more detail on that shortly. The most severe form of Google penalty is deindexing. This is where Google flat-out refuses to show any of the pages of your site. When this happens to a strong site which has previously had a steady flow of traffic/visitors, the effect can be devastating for the business, unless it has a steady stream of traffic coming in from elsewhere. 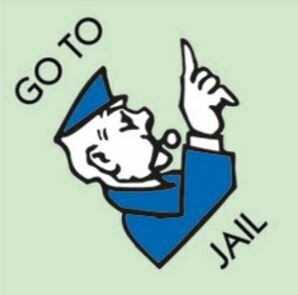 So how can you tell if you’ve received a penalty from Google? I’ll start off with an existing site. 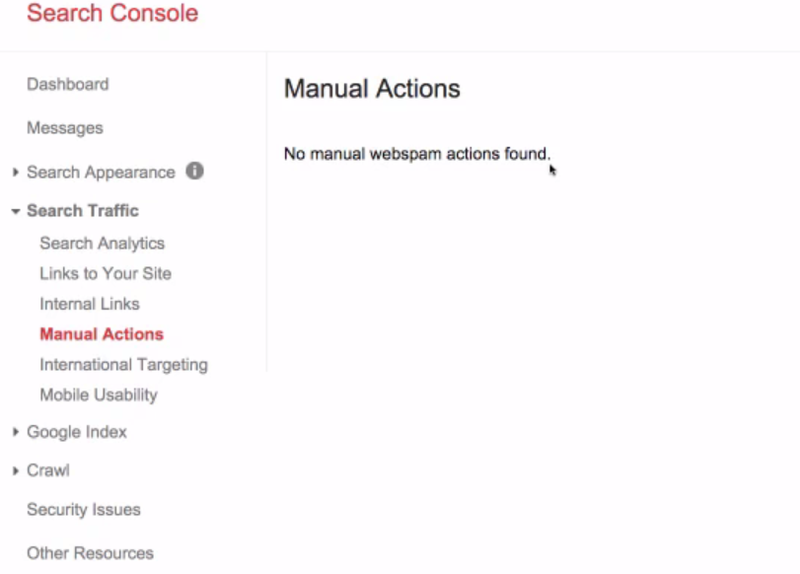 You’ll need to have installed Google Webmaster Tools (aka Search Console) on your site. If you haven’t yet done that, there’s a good tutorial here. and you’re free to do all the careful SEO work in the world to get your site ranking. “No manual webspam actions found” is the wording we’re after that means everything is OK.
What if it says something else. OK, here’s the part where things might have gone wrong. Don’t worry if you do see other wording here, and don’t take any hasty actions. Be calm! There’s a lot that can be done to fix any problems here and reverse a penalty. If you see a message similar to this in your Search Console, you’ve been hit by the Panda penalty. This is the name of the algorithm which Google uses to detect low quality pages. Google rewards sites that have plenty of good content on them, and as a shortcut, some website owners try to fill out various pages with keyword-heavy or spun content. (Spun content is text which has been rewritten by a program, producing an article which is often a poorly constructed Frankenstein’s monster of the original text. At one time this kind of content worked in SEO, but not anymore). Panda penalties also apply when there is little value to the content on a page, so if you have a hastily put together article which just fills the screen primarily with keywords, you’re probably not going to win against the Panda. The best thing to do in this situation is to keep the page, but replace the content. Once done, submit a reconsideration request through the search console. To do this, make sure you’ve fixed all of the content that was identified, and then click “Request a review”. You should hear back from Google within a few days to confirm that your penalty has been removed. In the earlier days of SEO, ranking was a very easy thing. You just had to have the most links coming through to your website with the relevant anchor text – the underlined text which is usually highlighted in blue. It took a few years for Google to be able to weed out this kind of manipulation, but when they did it caused a huge impact for the websites it hit. And it still happens today, but often in a much more subtle way. Google has caught onto the various methods that people use to acquire links – whether they’re spammy links from Russian websites (aka SAPE links), or whether they’re paid for in some way – Google often identifies them and penalises them. They’ve recently gone back to saying that they’re ignoring such links, but Penguin penalities still turn up in search consoles, often with the following wording. Google provide a “disavow” tool, which allows webmasters to remove the offending links from being counted by Google. This is not the recommended option – it’s more of a last resort. The best approach to take if you have links coming to your site which are not quite legitimate, is to get them deleted at the source. Contact the site owner and make the request. Only use the disavow tool as a last resort – if the sheer number of spammy links means that it would be an insurmountable task, then disavow, Otherwise, the manual approach is best..
Hopefully this article has given you the tools you need to deal with any penalties which might crop up with your website. If you have any question, do get in touch on 01606 374995.